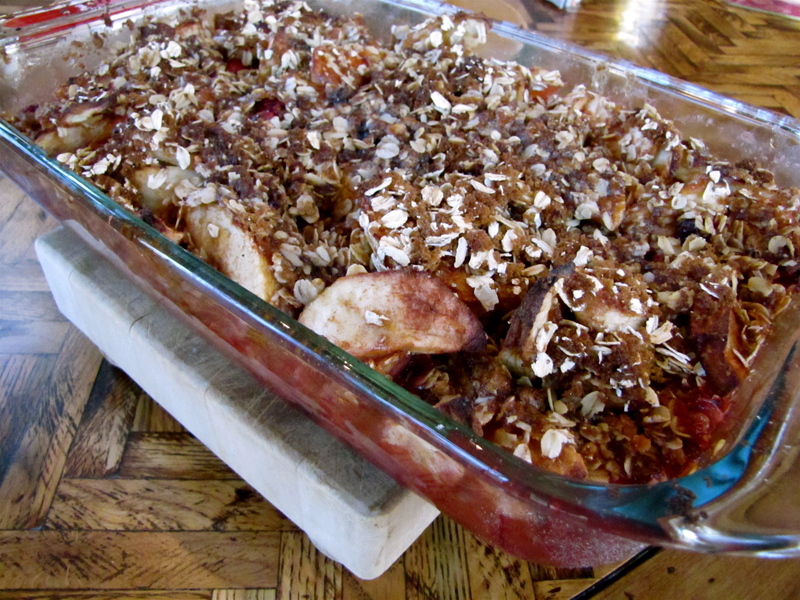 Apple Cranberry Crisp – Voila! I told you I’d have lots of apple recipes for you, and here’s one more! It may look like a funny mass of oats and apples, but it’s actually a heap of pure autumn goodness with a kick of cranberry tartness. We’re a bit appled-out here at the Kotecki Kompound (i.e. our one bedroom apartment), but there are plenty more fall recipes to look forward to! Why just this week I had my first bite of pumpkin bread of the season. Hip, hip, hooray (for the fall)! 1. In a mixing bowl, combine apples, 3/4 of the bag of cranberries, lemon juice, and vanilla. Toss to combine. 2. Layer sliced apples in a 9 x 12-inch baking pan. 3. Combine brown sugar, cinnamon, and oatmeal in a bowl. Cut in the butter. Sprinkle sugar mixture over apples. 4. Bake 45 minutes or until topping looks crunchy and apple-cranberry mixture are tender. I was looking for just such a recipe for a dinner party on Saturday night. I like the idea of cranberries combined with the apples. I actually used a combination of apples, pears, cranberries, and blueberries. It was great that I could make it the day before and then just throw it in the oven to reheat when we sat down to dinner. I served it with vanilla ice cream and a variety of cheeses. It’s a recipe I will use again, definitely! Pingback: Apple Spice Bars « Voila!